Google's Pixel 2 XL problems aren't going away as another issue with the new smartphone has cropped up, though Google promises a fix soon. Some users on the Pixel User Community forums have reported "very bad" sound quality when recording audio. Users describe the sound as high pitched and tinny. One user said they have little distortion during some recordings, while in others, the sound is significantly distorted. CNET was first to report the issue. This video, uploaded by a Pixel 2 XL user, demonstrates the poor audio quality when recording a video in 4K. Another user on the community group said their 4K videos have "crazy hazing" when the camera is in motion. As you can hear, the sound in the video is greatly distorted, not what you'd want from any phone, let alone a high-end device like this. The audio is garbled and higher notes have a scratchy, tin-tan effect. The person who recorded the video, which was posted on October 24, said they returned their Pixel 2 XL. It's unclear how widespread the problem is, and there don't appear to be any reports of the smaller Pixel 2 experiencing the same audio issues. Google is aware of the Pixel 2 XL audio issue reports, and told us in a statement a software fix is "rolling out in the next few weeks." This isn't the first problem to plague the Google Pixel 2 XL. 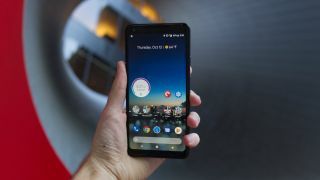 Screen burn-in on the new phone was widely reported, and late last week Google defended the screen tech it used in the Pixel 2 XL while also noting a software update to address the problem is on the way. Screen burn-in happens when an image lingers on the screen, and a ghost image remains visible. We'll let you know when the Pixel 2 XL fixes begin to make their way out.